We have been serving the Chelsea community for over 6 years and love working here. Our passion is seeing our patients achieve their goals. Robby was raised just north of Birmingham in Gardendale AL. He went to the University of Alabama and graduated with a degree in bio-kinetics. He then attended UAB for PT school and graduated in 2011. Robby is married to his beautiful wife Rebekah and they have a son named Lewis. 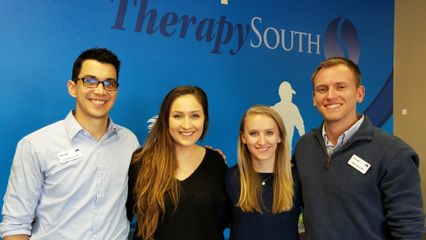 Robby joined the TherapySouth team in Jan. 2012 and worked at the Fultondale location for 2.5 years. He then became the clinic director in Chelsea and has remained there since 2014. Robby loves seeing a variety of patients. He loves working with senior adults and seeing them regain their function and independence after surgeries and injuries. He has played sports most of his life and he loves treating sports related injuries as well and getting those athletes back to 100%. He has loved working in Chelsea and looks forward to seeing what the future holds there.